At All Saints, we exist to pass on the Catholic faith. While we certainly take great pride in our excellent academics, extra-curricular activities and dedication to service, we are most proud of our commitment to developing the faith of all who are involved in our schools. Prayer, knowledge, service and sense of community are all important aspects to help faith grow. Students learn about their faith through the curriculum as well as the role modeling of our staff. Our faith is fully integrated into and throughout the entire school experience. Opportunities come in subtle and profound ways to share the love of Christ. It is our desire to take full advantage of all of these occasions. Students at every grade level attend religion classes for 30 to 50 minutes each day. The religion curriculum permeates the school as students are involved in daily prayer, prayer services, weekly Mass, praying the rosary and Stations of the Cross as well as community service projects. The Diocesan-developed religion curriculum ensures continuity of religious instruction from Kindergarten through 12th grade. At the high school level, there is an intensive four-year religion curriculum that provides students with an understanding of scripture, theology, church history, morality, sacramental life, and Christian service in light of the social justice teachings of the Catholic church. Students at all grade levels participate in weekly Mass. The students serve as lectors, cantors, musicians, eucharistic ministers and altar servers. 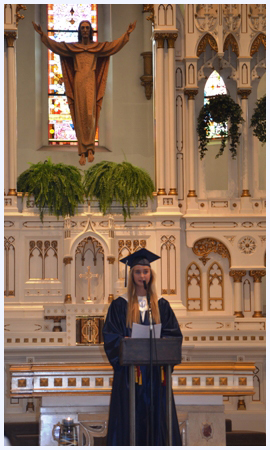 Students also attend Mass on all holy days during the school year. At all-school Masses, students, staff, parents and grandparents join together with pastors and pastoral administrators from the Vicariate to celebrate their faith. All Saints provides a family-like and faith-filled atmosphere that promotes student learning and development. Teachers, principals, and staff work together as a team to provide a safe and nurturing environment where students can thrive. Students are taught strong Christian values, solid study skills, and respect for others. Parents are welcome in their school buildings at any time and are visible and involved in the schools, on the playgrounds, and at after-school activities. Community service is a focus of the religion curriculum and the mission of our school. Students learn to put their faith into practice and learn the joy of sharing their talents and treasures with others. Students participate in a variety of activities, from penny drives to community beautification projects and dinners for local seniors. The mid-April, annual "Hoops for the Homeless" fundraiser to benefit Rescue Ministries of Mid-Michigan is always a highlight of the year. In addition to the school-sponsored outreach projects, high school students each complete 100 hours of community service in order to graduate. Our parents are committed to providing the best faith formation possible for their children. All Saints parents and students are actively involved in the life of their parishes, attend weekly Sunday and Holy Day Masses, and share their time, talent, and treasure with their parish family. Parents encourage their children to become involved in liturgical ministries as altar servers, Eucharistic ministers, lectors and cantors.